My wife purchased the $50 gift certificate for me as an added Christmas present (yep, she's awesome!). I'd recommend it as a great gift for one of your fellow players or for the partner of a hard-to-buy-for gamer. Personally, I was delighted. 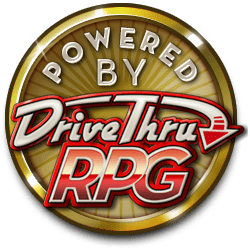 I spent quite some time looking through DriveThru's vast selection before I settled on the PDFs I chose. The gift certificate was really easy and straight forward to use - just add the code at checkout. It couldn't be simpler! All in all, I'm very happy.